At the beginning of her career in healthcare, Sister Mary Jean Ryan was neither a nun nor all that interested in working for a hospital. Ryan, who ended her career as an international leader in the movement to improve quality in healthcare, was trying to decide what to do after high school, having grown up in the tiny Wisconsin town of Cuba City. “I had no idea what I was going to do until a good friend of mine said, 'I think I'm going to St. Mary's for nursing school,' and I said, 'Well that sounds like a good idea. Maybe I'll do that too,' ” Ryan recalled. 1959: R.N. diploma, St. Mary's Hospital, Madison, Wis.
She didn't know what she was getting into. More than 60 years later, the former health system CEO and healthcare quality pioneer was named as a 2018 inductee into the Modern Healthcare Health Care Hall of Fame. Ryan said her experience of earning that registered nurse diploma was integral to her success. “It was the most important three years of my life,” Ryan said. 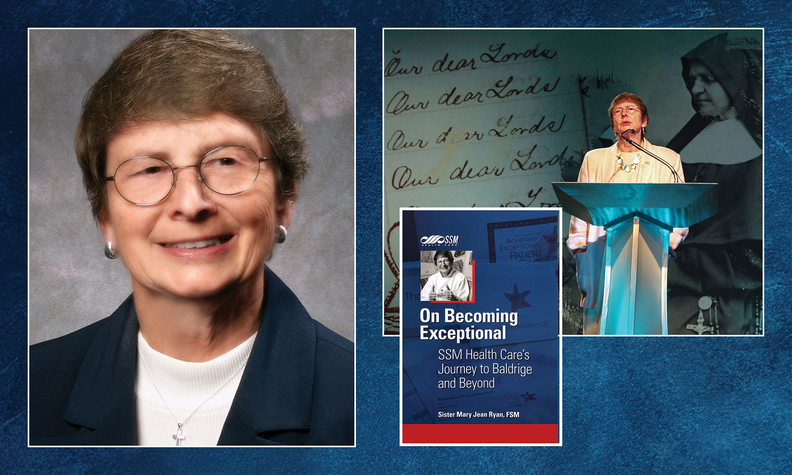 The basic tenets of care she learned at St. Mary's School of Nursing in Madison, Wis.—which was linked to a hospital in the SSM Healthcare system, where she eventually was CEO—would stick with her throughout her career. Ryan eventually would get a Bachelor of Science degree in nursing, from St. Louis University, an experience that reinforced her belief that so-called “diploma nurses” were sometimes underestimated by the healthcare field. “We could nurse circles around some of those women who were in their original baccalaureate program,” Ryan said. Another Catholic healthcare leader, Sister Carol Keehan, CEO of the Catholic Health Association, said that it was Ryan's inclusive nature that led her to stand out in the industry. “There are many, many people who will tell you that Sister Mary Jean was the key person responsible for them moving from modest positions into leadership roles,” Keehan said. Similarly, Gayle Capozzalo, executive vice president and chief strategy officer for Yale New Haven (Conn.) Health and one of two people who nominated her, said that Ryan was a person that other healthcare leaders could and did learn from, and she was active with the influential Institute for Healthcare Improvement and in quality circles in general. There's no simple way to chart the path of an RN from a small Wisconsin town who eventually became a top CEO authority on hospital quality; in 2002 Ryan led SSM to become the first healthcare organization to earn the Malcolm Baldrige National Quality Award. Ryan's career didn't follow the usual routes. But some of the highlights that Ryan identified offer clues as to the type of person she was and is. One of the stops along the way included a stint on the night shift at a South Carolina hospital when forms of segregation were still in effect, including in the maternity ward where the newborns were cared for. “We weren't breaking rules, but a great story that we have is (about) the nursery,” Ryan said. “Because there wasn't that much to do at night, they would put white babies in with the African-American babies, and then separate them again in the morning. And as far as we know, nobody ever suffered any kind of permanent damage from that,” she added dryly. Later in her career, as part of her grad school training, Ryan said she had a one-year residency at a for-profit hospital in California that delivered, as she described it, “one of those learnings.” And it was one of those learnings that tell you, “this is what I never want to do,” she said. Howard continued: “She's driven. A taskmaster and she will proceed to endeavor on a goal until she achieves it. That's just the absolute truth. “She is as focused on patient safety and quality as any human being I've ever known,” he said, adding that Ryan remained focused on “ensuring that the rights of all patients, employees, physicians and the community were represented."